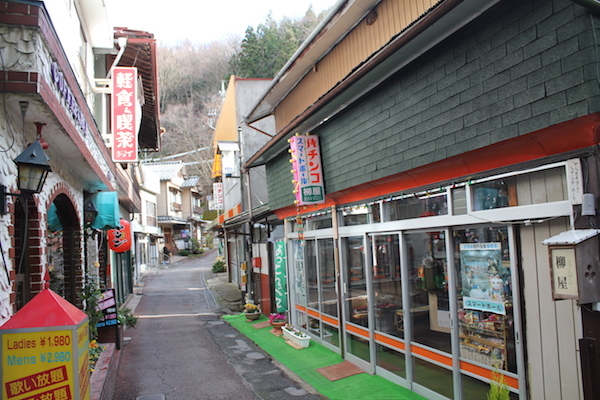 A four-hour bus ride away from Tokyo, Roman (四万温泉, Shima Onsen) overflows with nostalgic charm as well as healing spring waters. The unique hot spring experience found here continues to draw visitors to this isolated spot, deep in the mountains of Gunma Prefecture. The name “shima” (aka “shiman”) means 40,000, and it is said that the hot spring cures 40,000 types of illnesses. 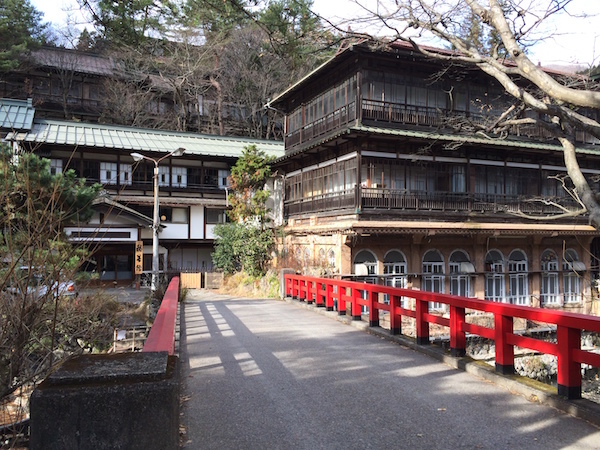 Shima Onsen was the first hot spring resort in Japan to become a Nationally Certified Onsen due to its wholesome environment and potential health benefits. The water here flows clear, yet has a smooth feel, and its concentration of minerals leaves white deposits along the riverbank. In recent years Shima Onsen has been gaining recognition due to an iconic red bridge, which served as a model for scenes in Hayao Miyazaki’s internationally award-winning film, “Spirited Away” and marks the entrance to the oldest hot spring inn in Japan, Sekizenkan Ryokan. A composite structure of different period buildings and baths, the maze-like hotel is a trip through time. The Edo era architecture of the main building, now designated an important prefectural cultural asset, with its low ceilings, sliding paper doors, and wooden construction, has remained largely unaltered since it was built in 1691. The connected Taisho-era Romanesque style bathhouse, with its high ceiling, tiled flooring and arched windows, remains in use alongside contemporary bathing amenities: a mysterious tunnel passageway on the second floor guides guests to the newer wing of the hotel with a luxurious outdoor bath surrounded by pine forest. The surrounding small, quintessential hot spring town is the antithesis of Tokyo, and has an outdated, Japanese-retro feel. There are no convenience stores. Japanese macaques scamper along the roadside and signs warn of bears in the area. During the spring, summer, or autumn, the spectacular foliage along the Agatsuma River, and the deep blue Lake Nozori, are recommended sights. In the winter, however, activities in the immediate area outside of the hotels are limited; many visitors stop by the small but cheerful game parlor specializing in “Smart ball.” Smart ball is the nowadays rarely-seen cousin of Pachinko, a pinball game ubiquitous in Japan. The game surprisingly requires some skill and its repetition is addictive. The owner of the parlor recommends trying your luck in the seat where Hayao Miyazaki sat during his last visit, from which you can gaze at the parlor walls covered in signatures from past celebrity visitors, collected over the course of half a decade of business.